This is one of the bending jigs I use. 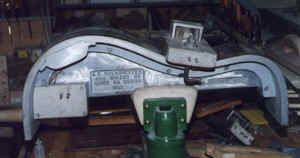 It is an old (perhaps 25 years) bending mold manufactured by A. E. Overholzer. Art wrote a very interesting (and somewhat controversial) book on classical guitar construction, and sold some very interesting tools as well (I recall that he had been a machinist in his early years). It is made of cast aluminum and has a heating element built in. All I do is plug it in and let it heat for about 10-15 minutes, then clamp the wood to the mold (photos to follow). I then turn it off and allow the wood to cool naturally to room temperature. The wood comes off fully bent and with little or no spring back. I also have one of these in a classic shape which I use for my concert shape guitar. I have several other bending jigs of a slightly different style. To see them and how they are used go to this page: Making the Ribs. It is essential to wet the wood before bending it. Some builders merely moisten the wood, but I have always soaked it in water. I use this trough (which I had made out of stainless steel after my first one rusted out), and use hot water. I used to heat the water while soaking the side, but no longer feel this is necessary. 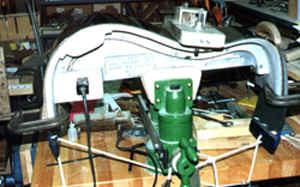 I soak it for about 10 minutes, which is the time that it takes for my bending jig to heat up to operating temperature. It should be noted that some woods need less (or more) soaking. For example, koa needs much less -- I soak koa perhaps 2 minutes. Some of the rosewoods like cocobolo can be soaked a much longer time although it may not be necessary. Although this photo is none too clear, it shows one of the ribs being bent. After the wood is soaked, and the jig is heated, the wood is clamped tightly to the jig, and heated for about 10 minutes, after which it cools to room temperature. While the photo doesn't clearly show it, there is a thin sheet of stainless steel on top of the wood, which is pulled as tight as possible. This will help keep the rib flat, and is necessary since the wood normally has a tendency to curl from side to side. Here is a rib, bent. 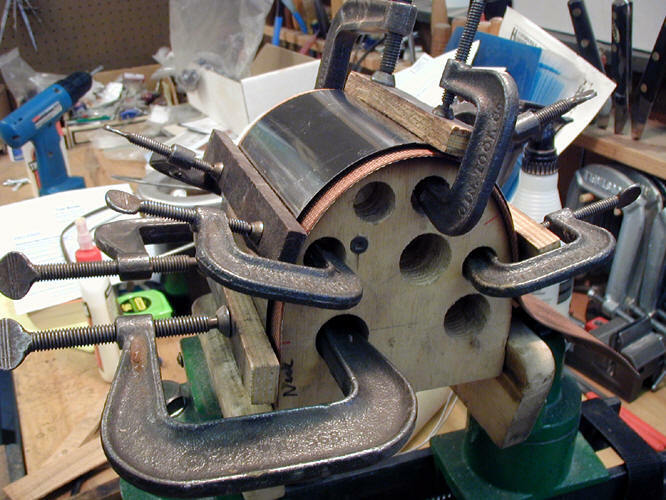 Bending a cutaway with a small heating blanket.